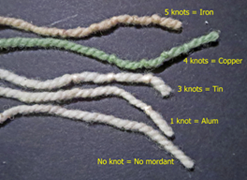 Testers and the "knot code"
When we want to keep a record of what a particular mushroom does with a particular wool or mordant, we need a way to identify what mordant was used. Before dyeing, it is not too hard to tell what mordant was used: no mordant obviously will leave just the original color of the wool, while alum will often turn the wool just a bit creamier in color than the original, especially if the wool was very white to start with. Copper mordant gives a rather pretty green to the wool even when not dyed, but certain mushrooms will turn copper-mordanted wool quite a dark brown or other unexpected colors after dyeing. Iron mordant gives a pinkish, almost rusty, cast to the color of the wool, but once dyed, you will not see any of that. I do not personally worry much about using copper or iron in mordanting because I don’t do it in large quantities and I do not use them nearly as much as alum. Many beautiful colors can be obtained with alum and I only go to copper or iron if I cannot get what I want with alum. Neither chrome nor tin is used much anymore, but the knot code remains the same. Testers can be done with a fresh sample of the mushroom in question, as an individual tester weighs very little and can even be thrown into the dye bath as the fresh mushroom is cooking. 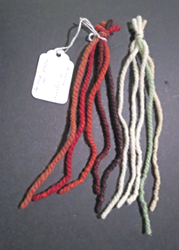 Once your tester is dyed, attach a label with name or description of mushroom and any unusual or special techniques (alteration of pH beyond usual for that mushroom, non-standard temperature, etc.). Add a description of the mushroom if it has not been positively identified, perhaps also the location where it was collected.